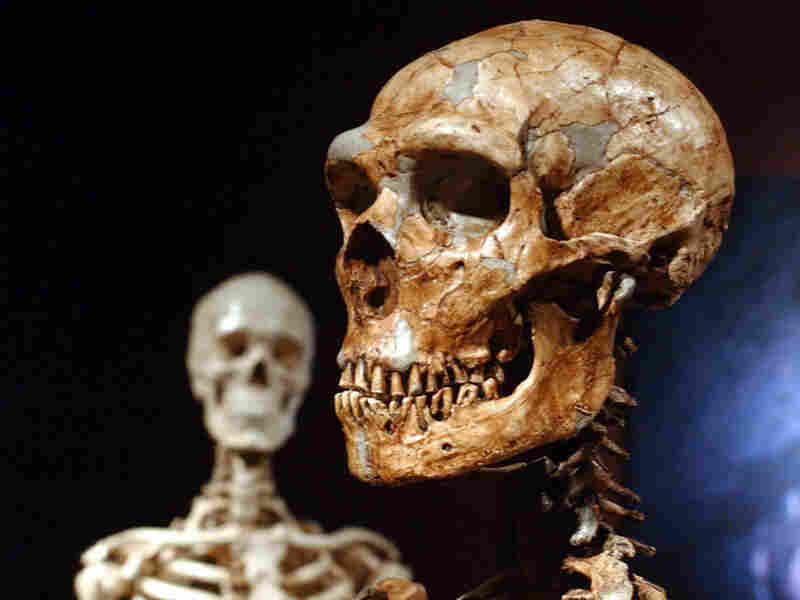 Growing Slowly, Humans Outsmarted Neanderthals Humans are the smartest creatures on Earth, and scientists are trying to figure out just how we got that way. Compared with our closest relative, the Neanderthal, who grew quickly and died young, our "slow growth" seems to explain our more sophisticated brain. This sculpture of a Homo neanderthalensis adult male represents Neanderthals that lived between 225,000 and 28,000 years ago. 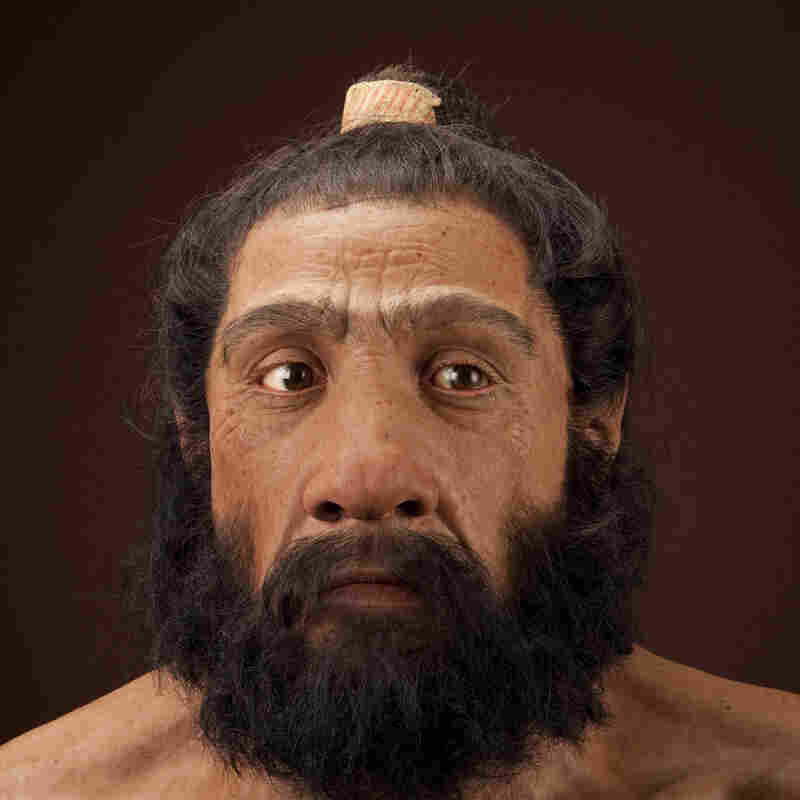 It is a reconstruction based on Shanidar 1, made for the Smithsonian Human Origins Initiative. It's safe to say that humans are the smartest creatures on Earth -- after all, what other species is going to argue with you? But scientists do puzzle over how we got smart. One way to figure that out is to look at the closest relative we ever had, the Neanderthal -- that lumbering cousin of humans that died out about 30,000 years ago. Now scientists have some new insights into what set humans and Neanderthals apart. Much of the time, Neanderthals were not apart from us. They lived in Europe alongside humans, and DNA evidence suggests they even mated with us. Despite our alleged intimacy, we think of them as dull, brutish and poor conversationalists. And they went extinct -- another sign of inferiority. Yet their brains were as big as ours, their tools just as good. So what did we Homo sapiens have that made us so clever? Like the 'slow food' movement, 'slow growth' gave complex brains more time to 'cook' and then learn all those things a fancy brain could learn. Tanya Smith, an anthropologist at Harvard University, explains one idea about how early humans got smarter. "Some of the earliest fossil Homo sapiens we have looked at show a really long period of growth and development," she says. "They did not live fast and die young; they seemed to have lived slow and died old." But Neanderthals apparently did live fast and die young. "Several of the ones that we studied seemed to have matured several years faster than you would have predicted," Smith says. Maturing quickly does have advantages in a world with many saber-tooth cats and no doctors or pharmacies. If you "live fast," you can reproduce sooner, and you pass on your genes more quickly. Archaeologists think humans matured more slowly than our Neanderthal relatives. The extra time helped our brains develop skills our closest relatives didn't have. Above, a reconstructed Neanderthal skeleton (right) and a modern human skeleton, on display at the Museum of Natural History in New York. But some scientists, including Jean-Jacques Hublin from the Max Planck Institute for Evolutionary Anthropology in Germany, believe modern humans developed a better way. "We take a long time to grow up and become adults, and this has a lot of implications in terms of social organization, time for education, maturation of the brain, even psychology somehow," Hublin says. Like the "slow food" movement, "slow growth" gave complex brains more time to "cook," so to speak, and then learn all those things a fancy brain could learn. That's the idea, anyway. And now, in two research papers just published, Hublin and Smith have laid out some new evidence that confirms what scientists have suspected. To put it very simply, I would say Neanderthals did not see the world as we see it. Hublin, a paleoanthropologist, used a medical imaging machine to compare the skulls of Neanderthal and human infants. Both grew big fast, but the shape of the Neanderthal brain was more primitive. The human shape was different from anything that came before. Hublin says he thinks that took longer, and also resulted in different wiring. "To put it very simply," Hublin says, "I would say Neanderthals did not see the world as we see it." And Smith's research backs that up with evidence from what lies below the brain -- the teeth. "Teeth have these tiny recorders locked inside them," Smith says. "Like rings in trees, teeth have lines that reflect every single day of their formation from birth until the end of childhood." Using high-powered X-rays, Smith counted those lines in the teeth of Neanderthals and early humans, and found that Neanderthal kids matured way faster than early humans did. "By age 8," she explains, "they've got an extra couple of teeth already out in the mouth, you know -- they are much closer to being adults than we would be at age 8." They say "slow growth" may not seem like such a big difference between two species that were apparently close enough to mate. But Hublin says it doesn't take much in a social species to create a survival advantage. "I used to make this joke that we never know what kind of relationship a Neanderthal had with his brother-in-law, and maybe this is what makes the big difference between the Neanderthal and us," Hublin says. Consider that when the relatives visit this Thanksgiving. Smith published her work in the latest issue of the Proceedings of the National Academy of Sciences; Hublin in the journal Current Biology.